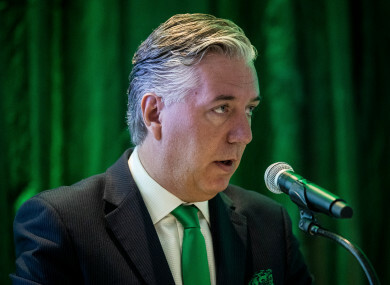 THE FOOTBALL ASSOCIATION of Ireland said it has responded to all queries from Sport Ireland after the agency requested “urgent clarification” regarding a loan provided by John Delaney to the FAI. The 51-year-old said the loan had been repaid in full, explaining that he acted in the best interests of the FAI. Yesterday evening Sport Ireland released a statement outlining that the statutory authority had not received any notification regarding a reduction in the association’s financial position. Tonight the FAI has released its own statement in response, saying: “The Football Association of Ireland confirms that a reply has been sent to John Treacy, CEO of Sport Ireland, in relation to a letter received on behalf of Minister for Transport, Tourism and Sport Shane Ross on Tuesday. Wednesday’s latest statement said the FAI was willing to meet with Minister Ross and Sport Ireland, adding that the association has also written to the Office of the Director of Corporate Enforcement offering clarification on any issues raised by the 2017 loan. The FAI also acknowledged that the association is invited to appear in the front of the Oireachtas Committee on Sport in three weeks’ time on 10 April. Email “FAI says it has answered all queries raised by Sport Ireland regarding John Delaney's €100,000 loan”. Feedback on “FAI says it has answered all queries raised by Sport Ireland regarding John Delaney's €100,000 loan”.